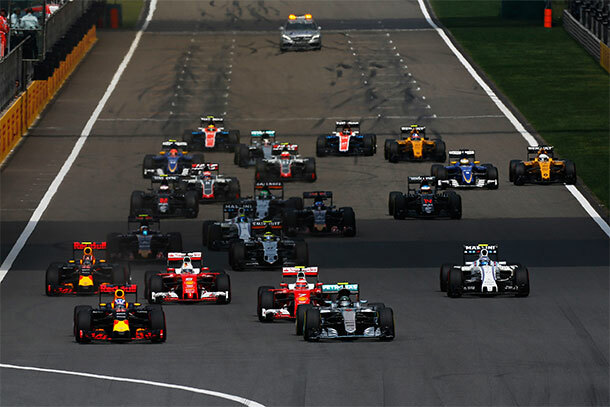 The first lap of the 2016 Formula 1 Chinese Grand Prix was one of the most dramatic in recent memory, with eventual race winner Nico Rosberg losing the lead to Daniel Ricciardo, - a Ferrari on Ferrari collision - and more bad luck for Lewis Hamilton, who lost his front wing to the Sauber of Felipe Nasr while attempting to avoid Kimi Raikkonen returning to the track. Sebastian Vettel ran into Raikkonen when he attempted to avoid the Red Bull of Daniil Kvyat as the Russian charged past in an aggressive but brave move down the inside. Raikkonen's front wing was damaged in the collision, and the Finn was forced into the pits for a replacement before fighting his way back up to fifth by the chequered flag. Vettel survived the incident, but dropped down to eighth and had to fight his way back up through traffic. For the first time in a long time, there was no moaning about the wide run-off areas surrounding the Shanghai circuit - had we been racing between the walls of the Marina Bay Street Circuit this weekend, few of those involved in the first lap chaos would have made it to the chequered flag. 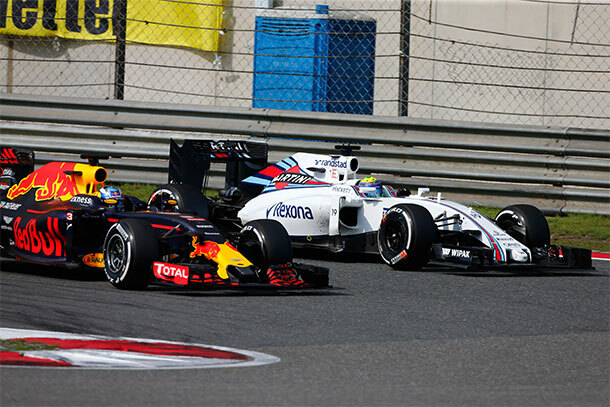 Instead, the whole field finished the race for the first time since the 2005 Italian Grand Prix. It was a road to recovery for much of the pack in Shanghai on Sunday, as the plethora of incidents in the opening laps left several of the frontrunners on the back foot. Add to that Lewis Hamilton's back of the grid start following a loss of power in Saturday's qualifying session and the stage was set for a mixed up grand prix of the highest order. While overtaking is a challenge on the tight streets of Marina Bay, Shanghai's wide track with its choice of lines around corners - and miles of runoff for those who get it wrong - makes for the ideal circuit on which to attempt a fight from the back. 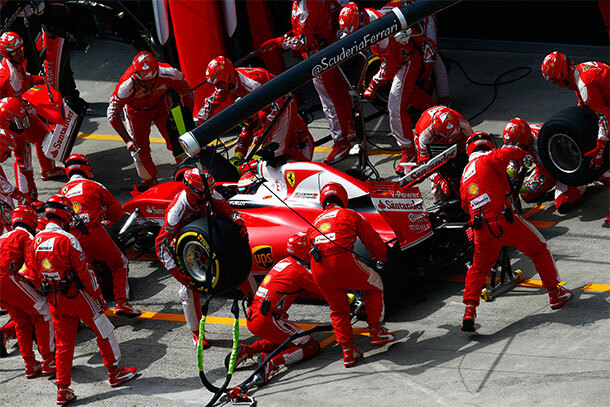 It was the Formula One pit crews who were the unsung heroes of Sunday's race, which saw 66 pit stops from the 22 drivers. 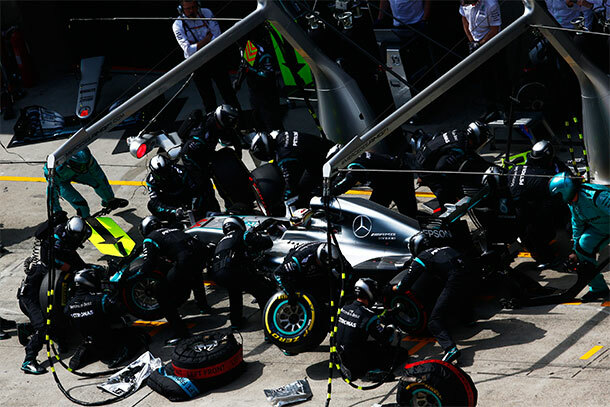 Hamilton could hardly stay out of the pits, completing five stops in the 56 laps of Shanghai International Circuit, and the Mercedes crew completed a combined eight stops for their two drivers. Last year's Singapore Grand Prix brought about a two-stop surprise on the strategy front, when the expected strategy was a three-stopper. Whether Marina Bay will be able to repeat the feat this year remains to be seen, as 2016's wider range of compounds - and the drivers' freedom to choose - has been shaking up the racing all season so far.